Even though the current weather might suggest otherwise, the golf season is just around the corner. 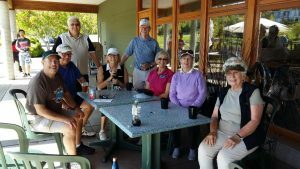 Last year was the first year of the CB55+ Golf Group. Collectively we played over 200 rounds over the summer in playing once a week at one of the following three courses: The Ridge, Mount Doug and Cedar Hill. 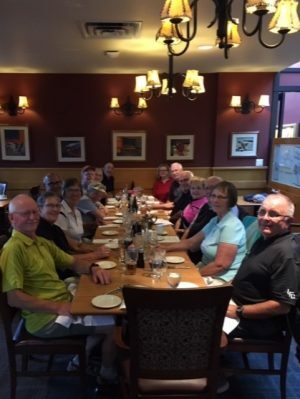 We also played the Nine and Dine once at Cordova Bay. Based upon positive feedback from participants last year, we have decided to continue with a similar schedule as last year, where we played at The Ridge one Monday afternoon per month; two Thursday mornings per month at Mount Douglas; and one Thursday morning per month at Cedar Hill. All of these events were nine holes. We are also hoping to have two Nine and Dine events at Cordova Bay. Our season will be starting on May 6th. 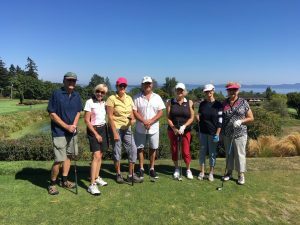 We have increased the number of golf outings at the 3 golf courses (The Ridge, Mount Doug and Cedar Hill), to 22 as compared to the 17 we had last year. Included in this increase is a 2nd Nine and Dine at Cordova Bay Golf Club. A possible indication of the success of our Golf Program is that we have grown from 39 players last year to 50 this year, with 21 being new players. New members are still welcome by contacting Ted Dobie (teddobiesenior@gmail.com) or Marilyn Brack (brackmg@gmail.com). This applies to both previous and new participants. Replies are requested by April 5th. Once all participants have signed up, we will provide more details on the timing of the golf events and details of the registration process. The goal of the group is to provide opportunities to play golf with others in a relaxed and social atmosphere. Because we are playing on public courses, participants are expected to have some experience playing golf and to know proper golf etiquette. We are not in a position to provide training to prospective golfers.